Permission-Based Digital Tracking enables organisations to obtain a more comprehensive picture of actual consumer online purchasing and consumption behaviour, complementing what is already known through traditional surveys. In 2017, Harris Interactive will start offering single-source permission-based digital tracking for our clients that passively gathers behavioural data in real time. To do this, we recruit consumers who provide permission for us to track what they do on different devices at different moments in time, and in different levels of detail. Simply enter your name and email below, and a member of our team will contact you to arrange a meeting to explain more about Permission-Based Digital Tracking and how it could work for your organisation. 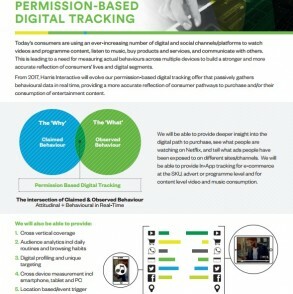 Permission-based digital tracking offer that passively gathers behavioural data in real time.